Page 3 of The Mythic Roots of Western Culture’s Alienation from Nature. Adams and Belasco. Tapestry Institute Occasional Papers, Volume 1, Number 3. July, 2015. Outline / List of Headings available here. Cultural Myths that underlie stories and images can be found by looking for similar patterns of character and action sequence in different venues. 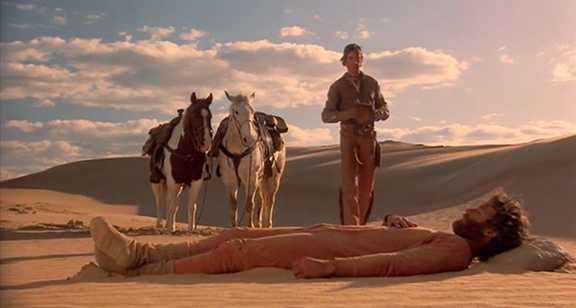 A remarkably parallel pattern of this type appears in the early scenes of two major films, produced nearly twenty-five years apart, that are set in different parts of the world and at different times in history: Lawrence of Arabia and Silverado. Exploring these patterns provides a key that allows us to uncover Western culture’s primary Myth about nature and its relationship to human beings. The sequence begins inside a building, in a very ordinary setting (before the cut). 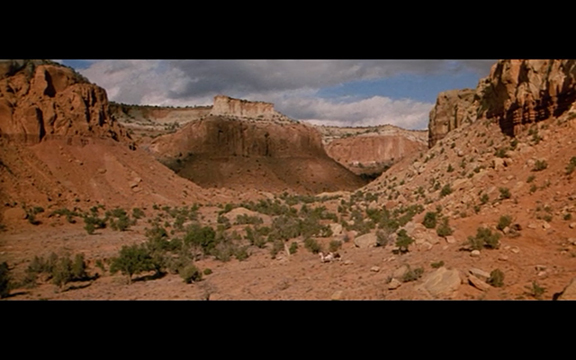 The sequence ends outside, in a dramatically wild setting with an enormous vista (after the cut). A sharp and dramatic “cut” occurs between these two parts of the sequence, so that the viewer is suddenly transported from inside to outside. There is no music during the part of the film that takes place inside (before the cut). Music rises when the viewer moves outside (after the cut). This music is the movie’s theme song, which is majestic, inspirational, and sweeping. When this music plays, the scene that’s shown is of a breath-takingly beautiful natural landscape. As the movie continues after the cut, the outside setting is seen to dwarf the human in size. The human moves into a desert landscape that is shown to be dangerous. Lawrence of Arabia, produced in 1962 (15), won a number of Academy Awards and is based on the autobiographical writings of British military officer T. E. Lawrence about his experiences in the Middle East during the early 20th century. The film actually expresses more than one major Mythic story, including Campbell’s Hero’s Journey Myth (16) and the White Savior Myth described by Matthew Hughey (17). The inside-to-outside film cut in this movie is a famous one that dramatically shifts the scene as a match is blown out. That scene, and the Myth-relevant elements that surround it, is below. You may want to replay the clip, or periodically pause it, to look for each of the steps listed above. Lawrence of Arabia. 1962. Columbia Pictures. Full citation below in ref. 15. Used under Fair Use as stated in the Copyright Act of 1976, 17 U.S.C. § 107. Silverado, a Western set in North America during the late 19th century, was produced in 1985 (18). The clip below shows the opening sequence, including the powerful “cut” point of an opening door and the scenes that immediately follow it. This sequence was fairly long in the film because of the initial gun battle, so that part is summarized by a series of still images narrated by a voice-over. No music plays in the film until it starts to rise in the part where the voice-over switches to soundtrack. The entire sequence of events took longer to play out in Silverado than it did in Lawrence of Arabia so still images are used to summarize the last two structural elements; nevertheless, all the elements occur so close together that the film’s opening credits are visible in the stills. Opening sequence of Silverado, through and past the major film cut that’s part of the pattern described above. Silverado. 1985. Lawrence Kasdan, Director. Lawrence Kasdan and Mark Kasdan, Writers. Columbia Pictures, Delphi III Productions. (Click the image to play the video clip.) Complete citation and Fair Use statement in ref. 18. Afterwards, the main character rides off into a landscape that’s so large it’s nearly impossible to see the man and horse in it until they move (clip below). Click the image to play the very short clip. Silverado. 1985. Complete citation and Fair Use statement in ref. 18. Please report problems playing the video file. Then, after passing through yet more vast landscape, the man and his two horses enter a desert. Silverado. 1985. Complete citation and Fair Use statement in ref. 18. We know the desert is dangerous because he comes upon a man dying of exposure there. Silverado. 1985. Complete citation and Fair Use statement in ref. 18. Though the credits are not visible in this image (so that the people are easier to see, unobstructed), this scene takes place before they have finished playing. Structural parallels in image (a building interior and a desert landscape), action sequence, and music in two such very different movies are highly meaningful. Each of the steps in the sequence, that we listed as bulleted points above, turns out to be vitally important to understanding the Mythic story being told in these scenes that open the movie and tell the audience’s unconscious minds what to expect. We will start our analysis by considering the sequence of events within the context of Campbell’s Hero’s Journey Myth. 15. Lawrence of Arabia. 1962. David Lean, Director. T. E. Lawrence, Robert Bolt, and Michael Wilson, Writers. Columbia Pictures. Images and film clips on this web page are used under Fair Use as stated in the Copyright Act of 1976, 17 U.S.C. § 107. 16. Joseph Campbell. 1973. The Hero With a Thousand Faces. Princeton University Press, Princeton NJ. 17. Matthew W. Hughey. 2014. The White Savior Film: Content, Critics, and Consumption. Temple University Press, Philadelphia. Chapter 1, “The Savior Trope and the Modern Meanings of Whiteness,” is available online at http://www.temple.edu/tempress/chapters_1800/2263_ch1.pdf. See also an author interview about the subject, on the Temple University Press Website, here: http://www.temple.edu/tempress/authors/2263_qa.html. For other discussions of the White Savior Myth elements visible in Lawrence of Arabia, see “History of Film: ‘Lawrence of Arabia'” by Omer M. Mozaffar, recipient of the Graham School of the University of Chicago “Excellence in Teaching” Award in Humanities, Arts, and Sciences. Movie Mezzanine website. 2014. Available online at http://moviemezzanine.com/history-of-film-lawrence-of-arabia/. Accessed June 24, 2015. And “T. E. Lawrence from the other side,” a blog post by U.S. Air Force officer and Middle East specialist Maj. Mark Jacobson. 2012. Available online at http://buildingpeace.net/2012/06/t-e-lawrence-from-the-other-side.html. Accessed June 25, 2015. Maj. Jacobson cites supportive documentation from Our Last Best Chance: A Story of War and Peace, by King Abdullah II of Jordan (2012. Penguin Books, 400 pages). King Abdullah addresses Lawrence’s story from the standpoint of not only a Jordanian and a descendant of the people with whom Lawrence dealt, but as the great-grandson of the Jordanian King at the time of Lawrence’s exploits. 18. Silverado. 1985. Lawrence Kasdan, Director. Lawrence Kasdan and Mark Kasdan, Writers. Columbia Pictures, Delphi III Productions. Images and film clips on this web page are used under Fair Use as stated in the Copyright Act of 1976, 17 U.S.C. § 107.